Yesterday, I pondered whether there might have been a sly nod to Frank O’Hara’s “Having a Coke with You” in the final moments of the Mad Men finale. Now, on further reflection, I think there may have been even more of an O’Hara connection than that. (Warning: spoilers ahead). 1) The finale was titled “Person to Person,” and it focused on the possibility of interpersonal communication and connection, especially through the conduit of the telephone call. Frank O’Hara’s most famous piece of prose is titled “Personism,” and it focused on the possibility of interpersonal communication and connection, especially through the conduit of the telephone call. What is “Personism”? Well, as O’Hara explains in his mock manifesto, “one of its minimal aspects is to address itself to one person (other than the poet himself)” so that “the poem is at last between two persons instead of two pages.” He also famously, half-jokingly proclaims that the movement began with a revelation about the telephone: the new movement “was founded by me after lunch with LeRoi Jones on August 27, 1959, a day in which I was in love with someone (not Roi, by the way, a blond). I went back to work and wrote a poem for this person. While I was writing it I was realizing that if I wanted to I could use the telephone instead of writing the poem, and so Personism was born.” Person to person, indeed. 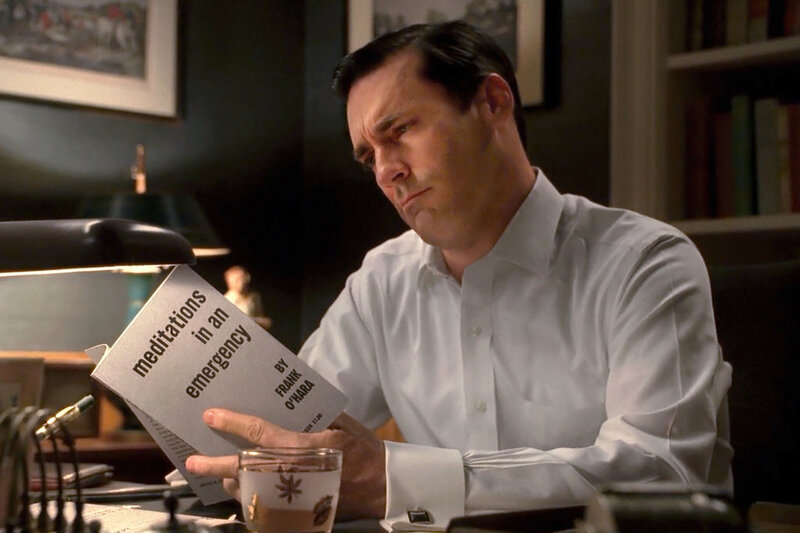 2) As Matthew Sitman pointed out on Twitter, the title of the O’Hara book that Don reads in season 2 — Meditations in an Emergency — surely resonates with the unusual (some might say contrived) plot of the finale, in which we find the normally buttoned-up Don Draper doing yoga and meditating at an Esalen-like retreat in the midst of a near-suicidal, existential panic attack. In other words, the final scenes depict a man literally meditating in an emergency. Get it? So there you have it: a unified theory proclaiming that the Mad Men finale was loaded with allusions to Frank O’Hara, the poet who changed Matthew Weiner’s life. It’s a very exciting theory which will undoubtedly have lots of adherents.